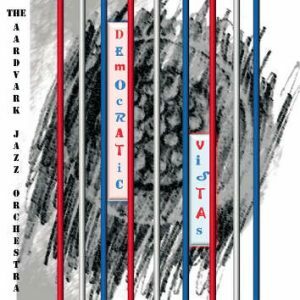 Home »Recordings»New CD Released: Democratic Vistas — Order Yours Today! New CD Released: Democratic Vistas — Order Yours Today! Inspired by Walt Whitman’s 1875 essay of the same name, DEMOCRATIC VISTAS is a Jeremiad on the corruption and spiritual/moral rot of our social-political situation. Among the pieces are the “De-Evolution Blues,” the 10-movement “Swamp-A-Rama” Suite, serious and satirical by turns—from the “Trumputin Tango” to “Fake News Blewz,” and our anthem of hope and inclusivity “No Walls.” Even more eclectic than usual, this is music to help get you through these turbulent times. This is Aardvark’s 15th CD and the 9th release on the prestigious Leo Records label. To order, please send a check payable to “Aardvark” in the amount of $18 (shipping & handling included) c/o Mark Harvey, P.O. Box 8721, JFK Station, Boston, MA 02114.